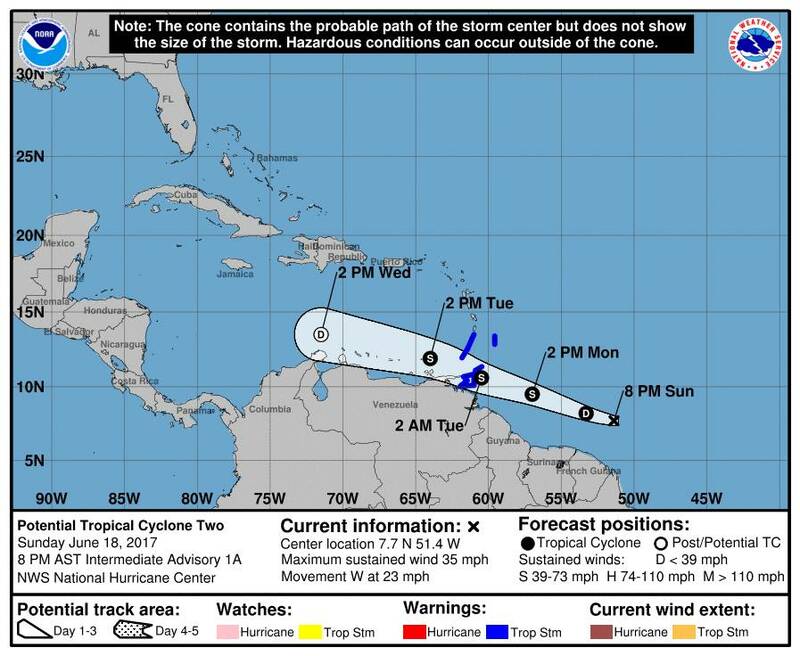 The National Disaster Management Agency (NaDMA) continues to monitor the weather with the technical assistance of the Meteorological Office at the Maurice Bishop International Airport. At 8 am Potential Tropical Cyclone #2 was located approximately 550 miles East South-East of Grenada. The disturbance was centred near latitude 8.7° North, longitude 54.7° West. The system is moving toward the west near 23 mph and is expected to move toward the west-northwest over the next 48 hours. Maximum sustained winds are near 40 mph with higher gusts. The central pressure is 1005 millibars. Some strengthening is forecast during the next 48 hours, and the disturbance is expected to be a tropical storm when it moves through the Windward Islands Monday night and Tuesday. Showers and thunderstorm activity associated with the disturbance continue to organise. This system has a high chance, (90%), of becoming a tropical cyclone within the next 2 to 5 days. A Potential Tropical Cyclone refers to a disturbance that has not yet become a tropical cyclone, but which poses the threat of bringing tropical storm or hurricane conditions to land areas within 48 hours. 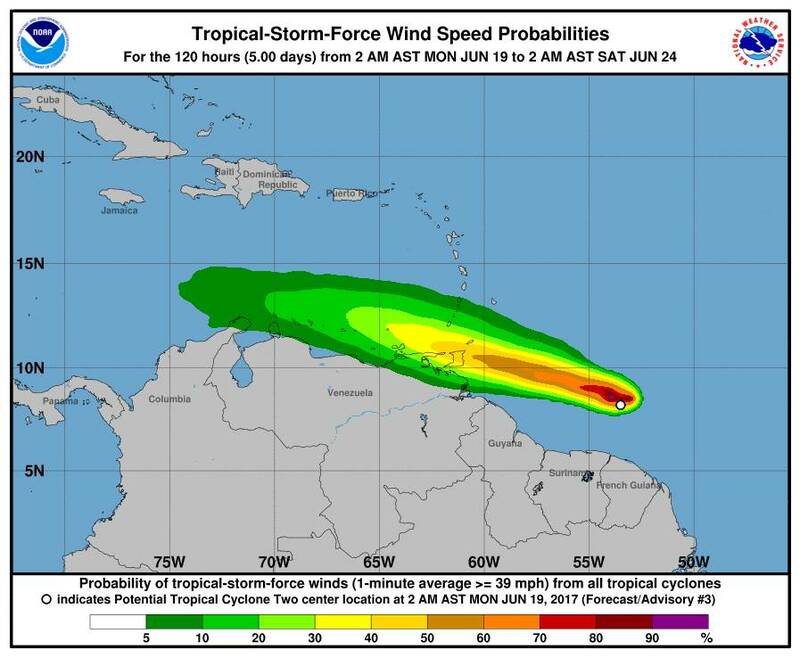 Tropical storm conditions are expected to first reach the state of Grenada overnight Monday into Tuesday morning with moderate to strong convection and thundershowers. The disturbance is expected to produce total rain accumulations of 50 to 125 millimetres over the Windward Islands. Gusty winds, flash flooding and landslides are possible. NaDMA takes this opportunity to remind us all that we should continue to be prepared at all times for all emergencies. Also, it is a good time to ensure that all drains and waterways around your property are cleared from all obstructions and that you have in place your hurricane plan and preparedness kit. The Agency in collaboration with the Meteorological Services will continue to monitor this Tropical Warning and will update the public as necessary. For additional information, please contact the National Disaster Management Agency (NaDMA) on 440-8390-4 & 440-0838, or email address nadma@spiceisle.com. NaDMA, the official source for all disaster-related information in Grenada.